Staying current on new and changing regulations and incorporating those changes into your internal compliance programs is a challenge for many organizations. Compliance professionals have realized that the traditional approach to managing regulatory updates, regulatory events, impact assessments, policies, compliance audits, and reporting to regulators will no longer scale to meet the new demands. 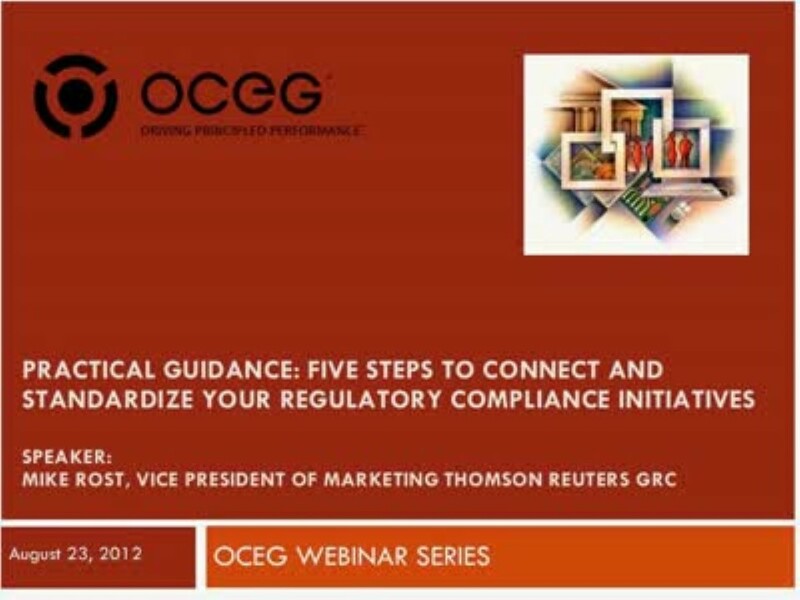 This webcast that explores five steps that every compliance organization can focus on to enhance collaboration across the organization and lead to a more thoughtful and connected approach to managing regulatory events and compliance processes. Experts from Thomson Reuters GRC business will provide insight on enhancing the full range of your organization’s compliance management from how to better manage unrefined information from disparate sources to assessing the true significance of an event or rule change to the business process it impacts. We have emailed instructions to access Practical Guidance: Five Steps to Connect and Standardize Your Regulatory Compliance Initiatives to . Make sure the email arrives in your inbox: either add "support@oceg.org" as a safe sender to your email platform, or if you use Gmail, drag our email into your Primary tab.